After WEG Double Silver, What’s Next for U.S. Dressage? 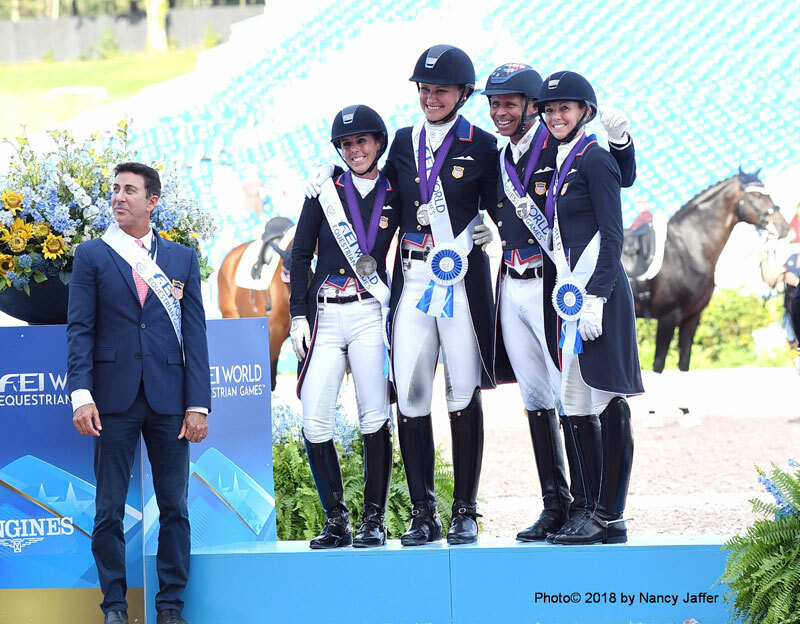 It took 16 years for the U.S. dressage team to replicate its historic placing at the 2002 FEI World Equestrian Games in Jerez, Spain, when it took team silver once again at the 2018 WEG, following years of Olympic and world championship bronze medals – as well as a couple of dry periods. The day after the WEG team prizes were awarded at the Tryon International Equestrian Center, another chapter was written in the history books when Laura Graves became the first American to take individual silver at a global championship in the discipline. She finished second in the Grand Prix Special on her Verdades behind perennial star Isabell Werth aboard Bella Rose, the leading combination of Germany’s gold medal team. Then following the Games, Laura and Verdades scored another American first, moving up to the top of the global dressage rankings, albeit by a single point. Only one thing was missing during a remarkable time for U.S. dressage, another head-to-head confrontation between Laura and Isabell in the WEG’s Grand Prix Freestyle. The WEG’s third dressage competition was called off because of heavy rains and high winds, the legacy of troublesome Hurricane Florence that put a damper, literally and figuratively, on the Games in North Carolina. Organizers and the FEI said they couldn’t figure out a way to hold the freestyle, since European horses were locked into a departure time on the day after the freestyle was cancelled. When Laura was informed the freestyle wouldn’t be held, she was devastated. About 12,000 tickets had been sold, which would have been the largest audience of her career. “I burst into tears. It hit me really hard. This is something I’ve struggled with pretty deeply since that day,” said Laura. “It was pretty obvious Isabell was on great form. Whether or not I would have beaten Isabell in Tryon, to have that freestyle I would have felt some more closure on the whole week. “There were 101 ways this could have been prevented, in my opinion,” she contended. Laura led the U.S. squad of Kasey Perry-Glass, Adrienne Lyle and Steffen Peters. All but Steffen are trained by Debbie McDonald, who will become the new U.S. Equestrian Federation dressage technical advisor in December. Laura is still looking for her next horse, which she wants to train herself. If she has to miss the 2020 Tokyo Olympics, she will, so she can take her time with her new mount. Verdades will be 18 in 2020, and she has no plans to push him for his second Olympics if it’s not in his best interests. Meanwhile, Laura hasn’t even decided whether she will compete Verdades next spring in the FEI World Cup Finals, the most important dressage competition of 2019 for the Americans. Since they qualified for Tokyo by virtue of their Tryon placing, the country doesn’t need to send the A-team to the Pan American Games in Lima, Peru. “God knows, I love World Cup,” said Laura, but her Dutch-bred gelding is barefoot in his paddock now. Laura will start thinking about her next move with him starting in November, when she trots him up after his break and sees how he is doing. While Robert Dover, who retires this fall after six years as U.S. dressage technical advisor, predicted the rise of U.S. dressage, he isn’t complacent. “This WEG was an ongoing statement of America’s strength in the sport of dressage. I was always hoping we would end up with the silver medal at least, and we did it in a very convincing way,” he said. At the same time, he pointed out, “It doesn’t really matter how well you have done, because you’re only as good as your last gig. Just because you are a powerhouse in the world in a particular theater, you still have to re-prove yourself every single time you go out of the country. “We have seen major countries in the sport like Holland [fifth at the WEG], truly fall from the podiums in the most dramatic way and have to really rethink their situation. We have even seen that with Germany, where they fell to a bronze at one point. They put a huge amount of energy and money into their U25 division, and brought along a whole new generation of new riders, with the exception of Isabell, who is a team unto herself,” he continued. He emphasized it’s necessary to “insure we have a steady stream of athletes, both two- and four-legged, flowing up to the elite division.